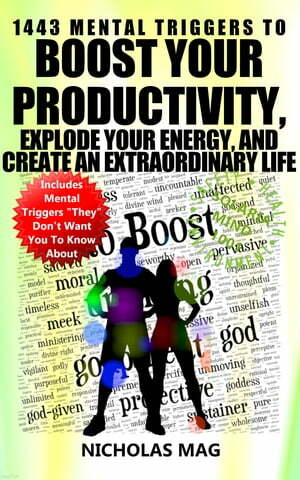 Collins Booksellers - 1443 Mental Triggers to Boost Your Productivity, Explode Your Energy, and Create An Extraordinary Life by Nicholas Mag, 9780463978412. Buy this book online. Do you need a Miracle? Yes, this is possible! This book is specially configured (order of words) for you to Boost Your Productivity, Explode Your Energy, and Create An Extraordinary Life. Quick effects. Some people reported beneficial effects from the very next day. However, beneficial effects occur between 3 days and 3 months, only in very rare cases it takes a longer time (6 months - 1 year). BUT I strongly recommend you to keep reading 3 mins (at least) a day, minimum 3 months because in this way the effects are very stable. You don't need a big chunk of your time or expensive programs. In this detailed and simple book, you find all the information you need. It gives you in detail a practical, very simple, effective and successful method. This book is a practical book that has over 350 pages. This book describes in detail a practical, very simple, effective and quick-action method called Solaria Mind 1001 (NEW), that helps you to Boost Your Productivity, Explode Your Energy, and Create An Extraordinary Life.